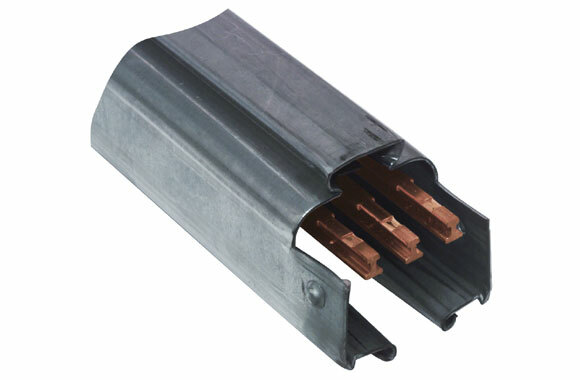 Heavy gauge zinc plated steel busway (track) complete with three (3) copper bus bars mounted on arc-resisting insulators. Door busway is identical to plain busway sections with the addition of a trap door to permit insertion or removal of trolleys. Polarizing flange assures proper electrical orientation of trolleys. Coupling Set (ERS-102) includes three (3) Bus Bar Connectors (E190-3). Note: It is recommended that a minimum of one door section be used with every five sections of plain busway. Item: Plain Busway 60 Amp, 300 Volt, AC/DC 2 or 3 Poles (10 ft.). Poles: 3. Length: 10'. Power: 60 Amp, 300 Volt, AC/DC Busway. 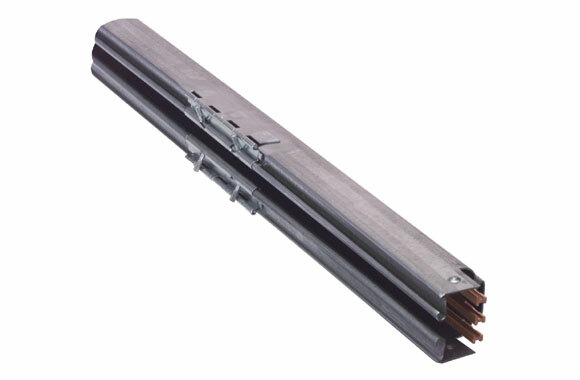 Item: Door Busway 60 Amp, 300 Volt, AC/DC 2 or 3 Poles (10 ft.). Poles: 3. Length: 10'. Power: 60 Amp, 300 Volt, AC/DC. Note: It is recommended that a minimum of one door section be used with every five sections of plain busway.